Despite the need for high temperatures during propagation , adult mandevillas only need a very mean 4.5 C ( 40 F ) minimum temperature in winter . this will encourage the plant to take a much needed seasonal rest . spring and summer minimums are a little higher at 13-18 C ( 55-65 F ) . No feed is necessary during the winter months . provide liquid feed in the recommended amounts once every two weeks during the summer . Mandevillas flower on the current season’s growth . encourage plenty of this by cutting away nearly all the flowering stems in the autumn when growth and flowering has noticeably slowed . When transplanting mandevillas use a soil – based potting compost and line the base of their containers with well- washed crocks or horticultural grit . if necessary move them into pots one size larger in the spring when growth commences . 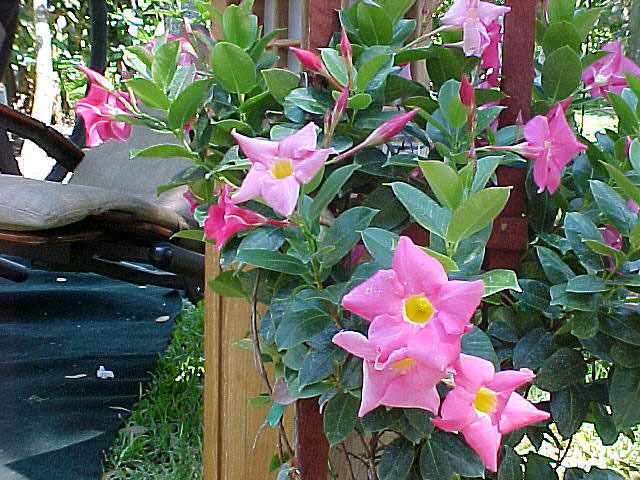 if the plant has reached its final pot size , simply top – dress with the recommended mixture.